Download "Appendix A of Project Management. Appendix Table of Contents REFERENCES...761"
3 Appendix A Glossary Terms of Project Management A Activity An element of work performed during the course of a project. An activity normally has an expected duration, an expected cost, and expected resource requirements. Activities are often subdivided into tasks. Activity delay The maximum amount of time that an activity can be delayed due to lack of resources. Activity-on-arrow (AOA) See arrow diagramming method. Activity-on-node (AON) See precedence diagramming method. 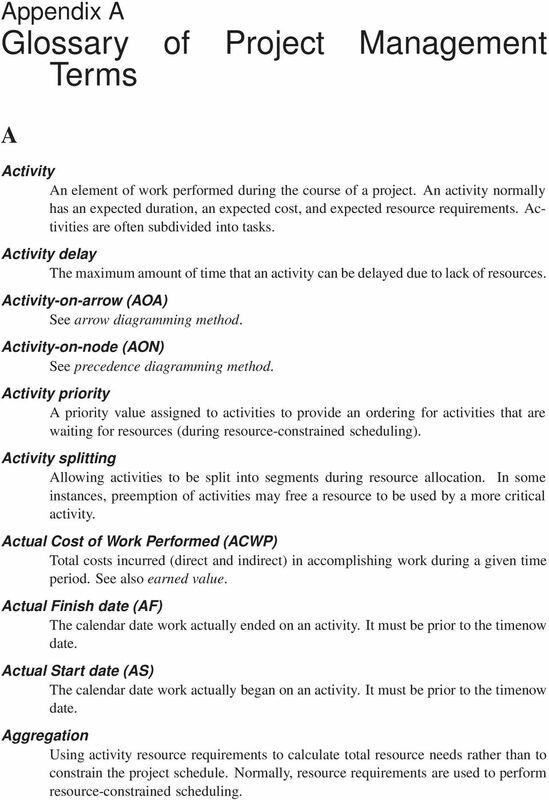 Activity priority A priority value assigned to activities to provide an ordering for activities that are waiting for resources (during resource-constrained scheduling). Activity splitting Allowing activities to be split into segments during resource allocation. In some instances, preemption of activities may free a resource to be used by a more critical activity. 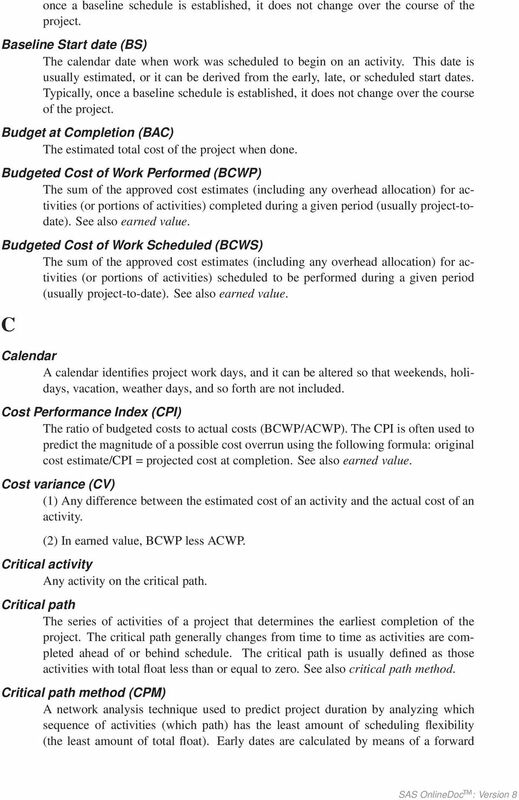 Actual Cost of Work Performed (ACWP) Total costs incurred (direct and indirect) in accomplishing work during a given time period. See also earned value. Actual Finish date (AF) The calendar date work actually ended on an activity. It must be prior to the timenow date. Actual Start date (AS) The calendar date work actually began on an activity. It must be prior to the timenow date. Aggregation Using activity resource requirements to calculate total resource needs rather than to constrain the project schedule. Normally, resource requirements are used to perform resource-constrained scheduling. 7 any schedule constraints. Early start dates can change as the project progresses and changes are made to the project plan. Earned value (EV) (1) A method for measuring project performance. It compares the amount of work that was planned with what was actually accomplished to determine if cost and schedule performance is as planned. See also actual cost of work performed, budgeted cost of work performed, budgeted cost of work scheduled, cost variance, cost performance index, schedule variance, andschedule performance index. (2) The budgeted cost of work performed, for an activity or group of activities. Earned value analysis See definition (1) under earned value. Effort The number of labor units required to complete an activity or other project element. Usually expressed as staffhours, staffdays, or staffweeks. Should not be confused with duration. 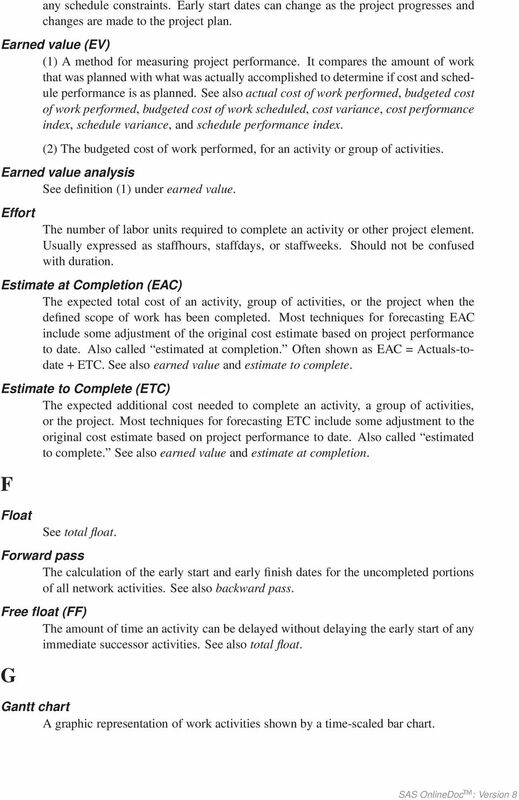 Estimate at Completion (EAC) The expected total cost of an activity, group of activities, or the project when the defined scope of work has been completed. Most techniques for forecasting EAC include some adjustment of the original cost estimate based on project performance to date. Also called estimated at completion. Often shown as EAC = Actuals-todate + ETC. See also earned value and estimate to complete. Estimate to Complete (ETC) The expected additional cost needed to complete an activity, a group of activities, or the project. Most techniques for forecasting ETC include some adjustment to the original cost estimate based on project performance to date. Also called estimated to complete. See also earned value and estimate at completion. F Float See total float. Forward pass The calculation of the early start and early finish dates for the uncompleted portions of all network activities. See also backward pass. Free float (FF) The amount of time an activity can be delayed without delaying the early start of any immediate successor activities. See also total float. G Gantt chart A graphic representation of work activities shown by a time-scaled bar chart. 8 756 Appendix A. Glossary of Project Management Terms Graphical Evaluation and Review Technique (GERT) A network analysis technique that allows for conditional and probabilistic treatment of logical relationships (that is, some activities may not be performed). H Holiday A period of time within the project timeframe when work cannot be scheduled. Holidays can be assigned to one or more calendars. L Lag A modification of a logical relationship that directs a delay of the successor task. For example, in a finish-to-start dependency with a 10-day lag, the successor activity can start 10 days after the predecessor has finished. See also lead. 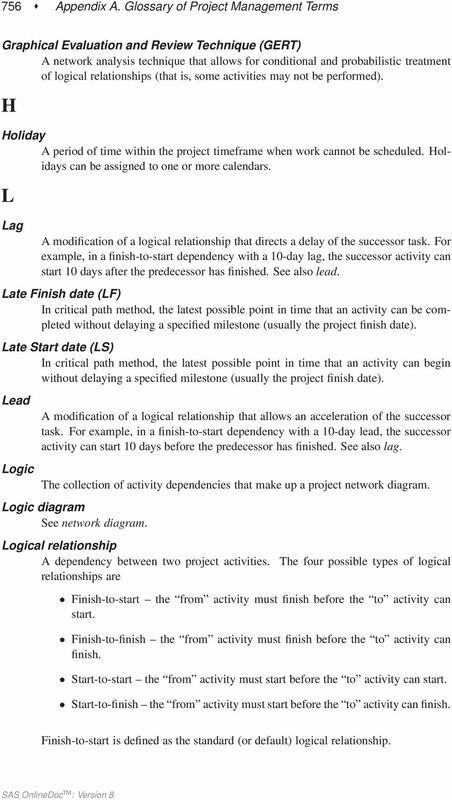 Late Finish date (LF) In critical path method, the latest possible point in time that an activity can be completed without delaying a specified milestone (usually the project finish date). Late Start date (LS) In critical path method, the latest possible point in time that an activity can begin without delaying a specified milestone (usually the project finish date). Lead Logic A modification of a logical relationship that allows an acceleration of the successor task. For example, in a finish-to-start dependency with a 10-day lead, the successor activity can start 10 days before the predecessor has finished. See also lag. The collection of activity dependencies that make up a project network diagram. Logic diagram See network diagram. Logical relationship A dependency between two project activities. relationships are The four possible types of logical Finish-to-start the from activity must finish before the to activity can start. Finish-to-finish the from activity must finish before the to activity can finish. Start-to-start the from activity must start before the to activity can start. Start-to-finish the from activity must start before the to activity can finish. Finish-to-start is defined as the standard (or default) logical relationship. 9 Loop M A network path that passes the same node twice. Loops cannot be analyzed using traditional network analysis techniques such as CPM and PERT. Loops are allowed in GERT. Maximum number of segments This value specifies the maximum number of segments that an activity can be split into when activity splitting is allowed. Milestone A significant event in the project, usually completion of a major deliverable. Minimum segment duration This value specifies the minimum duration of a segment of an activity when activity splitting is allowed. N Near-critical activity An activity that has low total float. Network See network diagram. Network analysis The process of identifying early and late start and finish dates for the uncompleted portions of project activities. See also critical path method, Program Evaluation and Review Technique, andgraphical Evaluation and Review Technique. Network diagram A schematic display of the logical relationships of project activities. Always drawn from left to right to reflect project chronology. Often incorrectly referred to as a "PERT chart." Network logic See logic. Network path Any continuous series of connected activities that make up a project network diagram. Node One of the defining points of a network; a junction point joined to some or all of the other dependency lines. Also, the graphic representation of an activity. 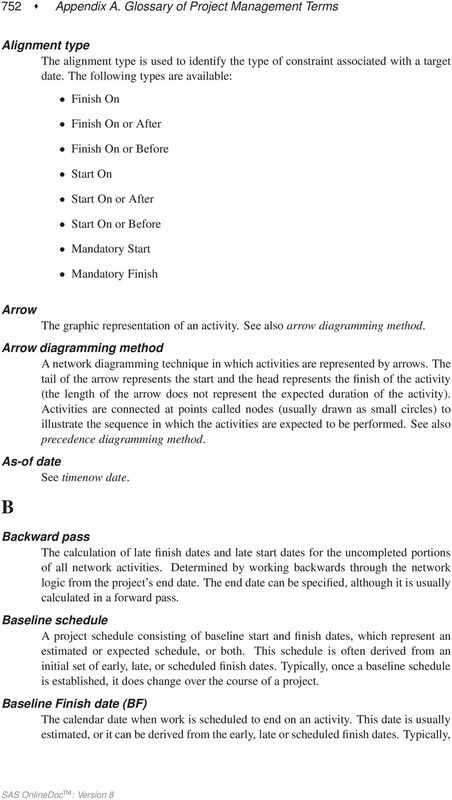 See also arrow diagramming method and precedence diagramming method. Non-standard logical relationship A dependency between two project activities that is not the standard finish to start relationship. See logical relationship for the four possible types of relationships. 10 758 Appendix A. Glossary of Project Management Terms O Organizational breakdown structure (OBS) A depiction of the project organization arranged so as to relate work packages to organizational units. Overlap See lead. P Parent task See supertask. Path A set of sequentially connected activities in a project network diagram. Path float See total float. Percent complete An estimate, expressed as a percent, of the amount of work that has been completed on an activity or group of activities. PERT chart A specific type of project network diagram. See Program Evaluation and Review Technique. Precedence diagramming method (PDM) A network diagramming technique in which activities are represented by boxes (or nodes). Activities are linked together by precedence relationships to show the sequence in which the activities are to be performed. Precedence relationship The term used in the precedence diagramming method for a logical relationship. In current usage, however, precedence relationship, logical relationship, and dependency are widely used interchangeably regardless of the diagramming method in use. Predecessor activity Any activity that exists on a common path with the activity in question and occurs before the activity in question. Pre-emption See activity splitting. 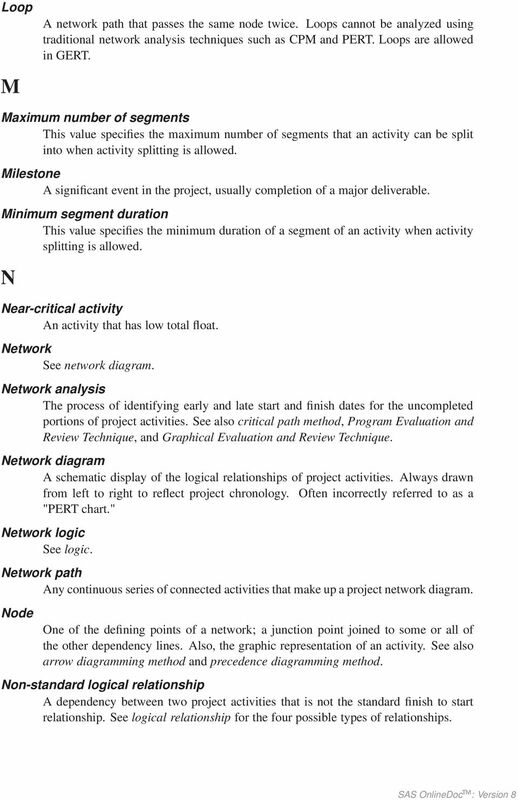 Program Evaluation and Review Technique (PERT) An event-oriented network analysis technique used to estimate project duration when there is a high degree of uncertainty with the individual activity duration estimates. PERT applies the critical path method to a weighted average duration estimate. Project A temporary endeavor undertaken to create a unique product or service. A project consists of one or more activities. 11 Project management The application of knowledge, skills, tools, and techniques to project activities in order to meet or exceed stakeholder and expectations from a project. Project Management Body of Knowledge (PMBOK) An inclusive term that describes the sum of knowledge within the profession of project management. As with other professions such as law, medicine, and accounting, the body of knowledge rests with the practitioners and academics who apply and advance it. The PMBOK includes proven, traditional practices that are widely applied as well as innovative and advanced ones that have seen more limited use. Project network diagram See network diagram. Project schedule The planned dates for performing activities and the planned dates for meeting milestones. R Remaining duration The amount of time needed to complete an activity. 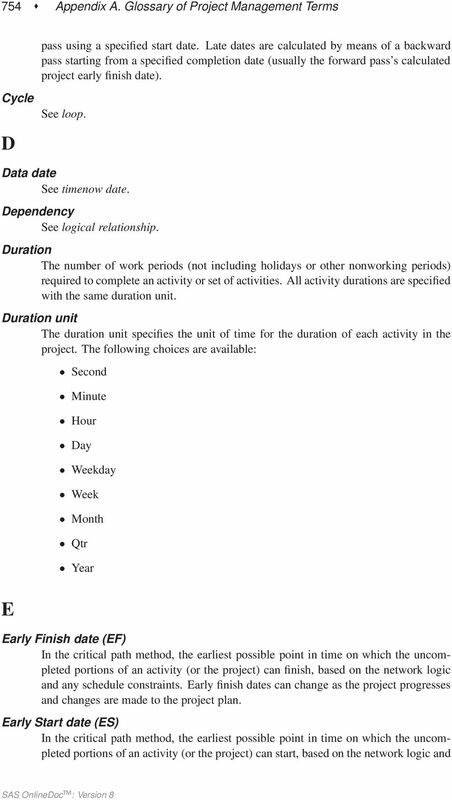 Resource-constrained scheduling The scheduling of activities in a project with the knowledge of certain resource constraints and requirements. This process adjusts activity scheduled start and finish dates to conform to resource availability and use. 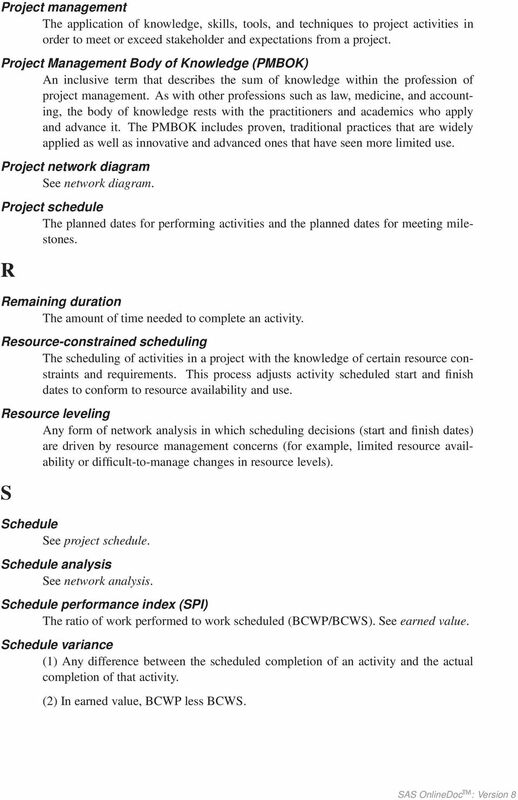 Resource leveling Any form of network analysis in which scheduling decisions (start and finish dates) are driven by resource management concerns (for example, limited resource availability or difficult-to-manage changes in resource levels). S Schedule See project schedule. Schedule analysis See network analysis. Schedule performance index (SPI) The ratio of work performed to work scheduled (BCWP/BCWS). See earned value. Schedule variance (1) Any difference between the scheduled completion of an activity and the actual completion of that activity. (2) In earned value, BCWP less BCWS. 12 760 Appendix A. Glossary of Project Management Terms Scheduled Finish date (SF) The date when the activity is scheduled to be completed using the resourceconstrained scheduling process. Scheduled Start date (SS) The date when the activity is scheduled to begin using the resource-constrained scheduling process. This date is equal to or greater than the early start date. Slack Term used in PERT for float (see also total float). Subtask An activity that is contained within a supertask. Successor activity Any activity that exists on a common path with the activity in question and occurs after the activity in question. 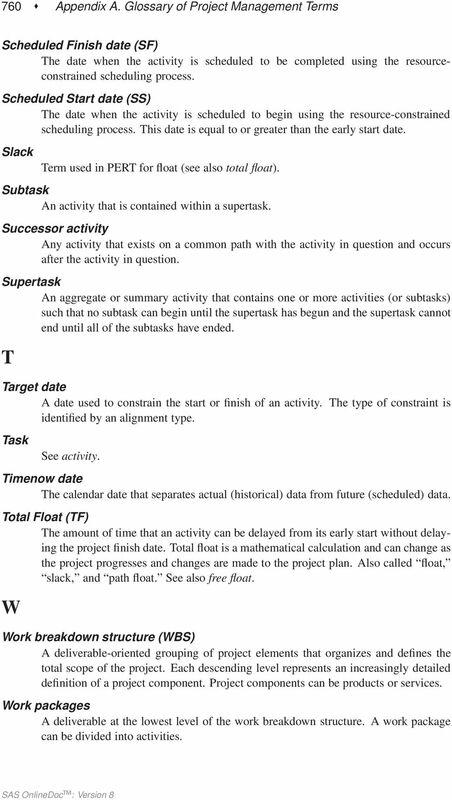 Supertask An aggregate or summary activity that contains one or more activities (or subtasks) such that no subtask can begin until the supertask has begun and the supertask cannot end until all of the subtasks have ended. T Target date A date used to constrain the start or finish of an activity. The type of constraint is identified by an alignment type. Task See activity. Timenow date The calendar date that separates actual (historical) data from future (scheduled) data. Total Float (TF) The amount of time that an activity can be delayed from its early start without delaying the project finish date. Total float is a mathematical calculation and can change as the project progresses and changes are made to the project plan. Also called float, slack, and path float. See also free float. W Work breakdown structure (WBS) A deliverable-oriented grouping of project elements that organizes and defines the total scope of the project. Each descending level represents an increasingly detailed definition of a project component. Project components can be products or services. Work packages A deliverable at the lowest level of the work breakdown structure. A work package can be divided into activities. 13 References 761 Workshift One or more pairs of on/off working times that define the valid working periods within a single day. References A Guide to the Project Management Body of Knowledge, Upper Darby, PA: Project Management Institute. 14 The correct bibliographic citation for this manual is as follows: SAS Institute Inc., SAS/ OR User s Guide: Project Management, Version 8, Cary, NC: SAS Institute Inc., pp. 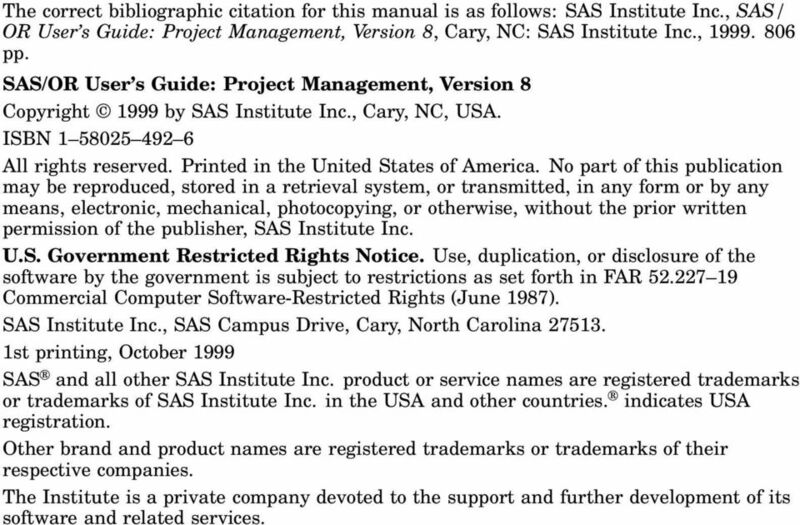 SAS/OR User s Guide: Project Management, Version 8 Copyright 1999 by SAS Institute Inc., Cary, NC, USA. ISBN All rights reserved. Printed in the United States of America. 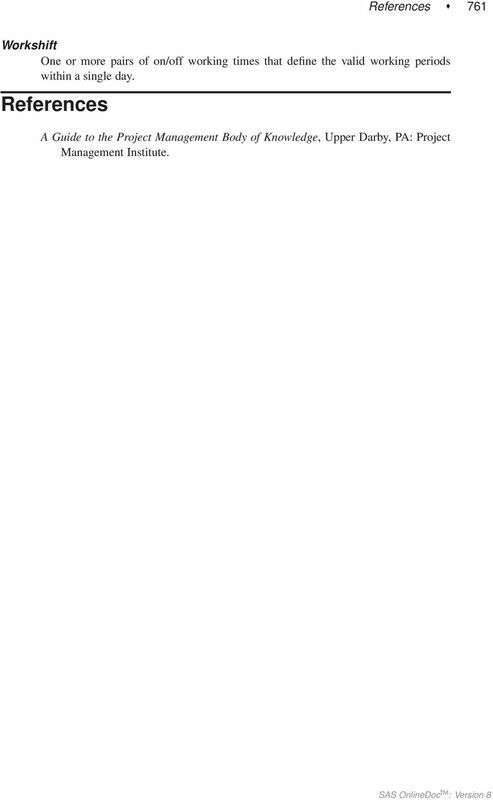 No part of this publication may be reproduced, stored in a retrieval system, or transmitted, in any form or by any means, electronic, mechanical, photocopying, or otherwise, without the prior written permission of the publisher, SAS Institute Inc. U.S. Government Restricted Rights Notice. Use, duplication, or disclosure of the software by the government is subject to restrictions as set forth in FAR Commercial Computer Software-Restricted Rights (June 1987). SAS Institute Inc., SAS Campus Drive, Cary, North Carolina st printing, October 1999 SAS and all other SAS Institute Inc. product or service names are registered trademarks or trademarks of SAS Institute Inc. in the USA and other countries. indicates USA registration. Other brand and product names are registered trademarks or trademarks of their respective companies. The Institute is a private company devoted to the support and further development of its software and related services. PMBOK GLOSSARY. Activity Duration Estimating. Estimating the number of work periods which will be needed to complete individual activities. Precedence Diagram Method CSTM 462 Planning & Scheduling Precedence Diagramming Method (PDM) PDM is more flexible than AON or AOA networks because PDM allows the overlapping of concurrent activities. Project Management. ZEUS Student Seminar on 14 th November 2003 by Riko Wichmann. Riko Wichmann, MPY Zeus Student Seminar - PM, 14.11. Earned Value Management Changes to the Glossary and Chapter 7 of the PMBOK Guide Third Edition. added to the task, using Project, it will automatically calculate the schedule each time a new resource is added.